To find Queen Umbra’s mirror, which will open the path to home. 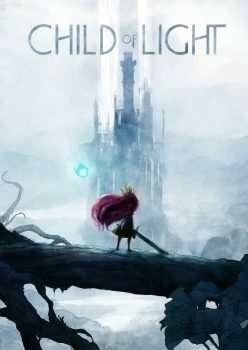 As outlined in my stunning poem up there, Child of Light revolves around Princess Aurora, the daughter of a duchess and duke from 1895 Austria. She’s transported to the kingdom of Lemuria, a world that had its light stolen by the Dark Queen Umbra, and must find her way back home. Naturally Aurora isn’t alone in her journey — she’s accompanied by a colorful assortment of characters including a sister-brother jester duo, a cowardly dwarf, an enterprising mouse and a firefly named Igniculus. Each party member has their own specialties in battle and their own reason for joining with Aurora in the first place. Igniculus, on the other hand, was created specifically for Aurora and is therefore a bit naive about how the world works. As you travel along, you’ll notice that enemies are viewable in the field and can be approached or avoided as you please; players can actually stun enemies using Igniculus’s light, then sneak past them. Touching them initiates battle and depending on you and the foes’ position, it will start out normally, as a surprise attack (in your favor) or an ambush (in the foes’ favor). Combat in this title is a loving tribute to JRPGs of old, and Ubisoft has managed to combine strategic depth with surprisingly fast-paced action (think Final Fantasy X‘s class-based character switching system combined with the speed and flow of X-2). Party members, as mentioned before, have their own classes; battles are essentially speed chess matches that require players to switch out members to suit your own needs and the changing flow of combat. A small detail, but I adore the fact that most of the characters don’t actual resemble stereotypical classes seen in most JPRGs: for instance the healer/supports are two clowns with a mean physical attack, the dwarf is a black mage, the mouse specializes in archery and of course a little girl is the hard hitter of the group. The turn-based aspect of this game is rather unique. Pictured above is the Action bar and every character in battle is represented on it. The bar section represents the Wait period while the red area is for any casting. When a party member or foe reaches the line separating the two sections, they get to choose a command and/or skills. Each skill or command has a certain charge time (Instant, Short, Medium, Long and Very Long) that determines how quickly the character will move through the cast period. Igniculus can cast his light on enemies to blind them and make them wait and cast much slower. And if one character attacks another while casting, it interrupts them and they get sent back to the beginning of the bar. It sounds simple enough but much of your strategy in battle will revolve around manipulating this gauge to benefit you and disfavor your enemies. Difficulty is what makes combat truly shine. Each random encounter is difficult enough alone but bosses battles make you feel like you’re in an epic struggle for your life. However, the game never crosses the line into fake difficulty. You feel the insurmountable odds but there’s also a certain rush; the best way to explain it is that you know if you just keep at it and never give in, you’ll eventually succeed. That’s what a truly fantasy JRPG should feel like. 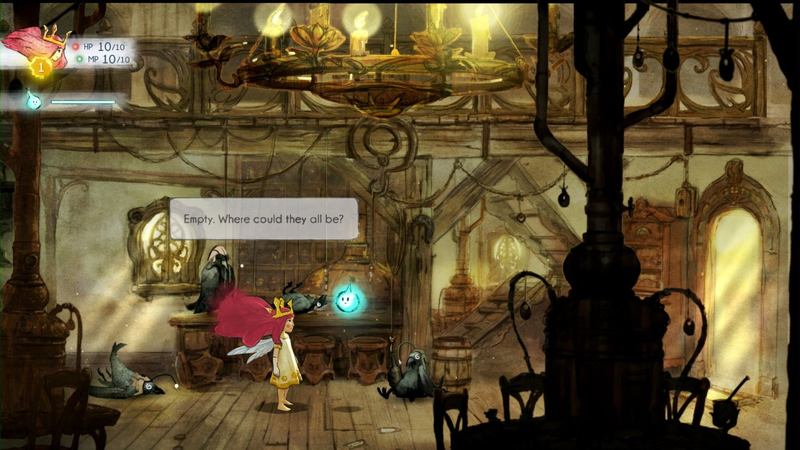 There is a slight difference between your typical JRPG and Child of Light, which is the leveling system. 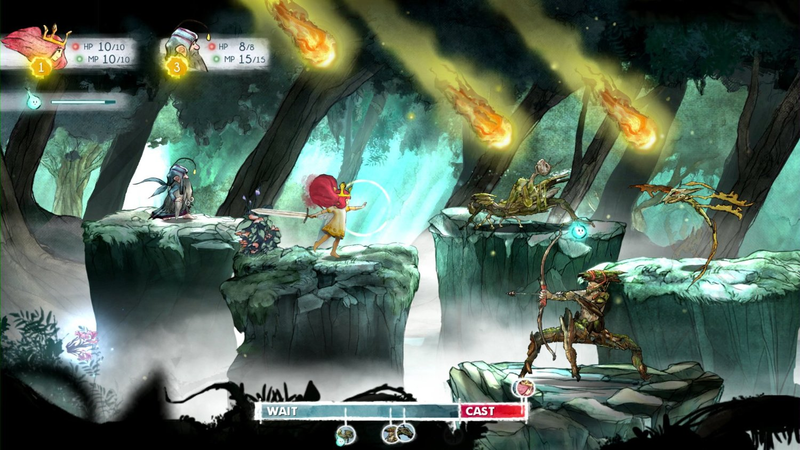 Games in the former category tend to use a more straightforward approach of “gained levels = gained skills.” This title uses skill trees, giving more customization options to allies, due to the fact that there are three entry points in said trees that host a different group of skills. An important part of growth is choosing what skills you want your allies to specialize in, since skill points are hard to come by. Another difference between JRPGs of yore and this title deals with the lack of actual equipment. Instead, players must craft gems called Oculi that power up offense, defense and host other properties. Each Oculi falls under a rank that defines its quality — Rough, Tumbled, Faceted and Brilliant — and the main goal is to craft lower ranks into higher ranking ones. You can also mix and match different types to make different Oculi. Once again this may seem simple, but the process is deep and can take quite a while to fully master. Platforming is equally as strong, with fluid controls and subtle puzzle designs that blend in with the environment. In the beginning Aurora can only run and jump but later she’s given a pair of beautiful wings for flying. At first, I was worried that she would have a limit to how long she could fly or that platforming would be ground based. Thankfully, I was proven wrong almost immediately. 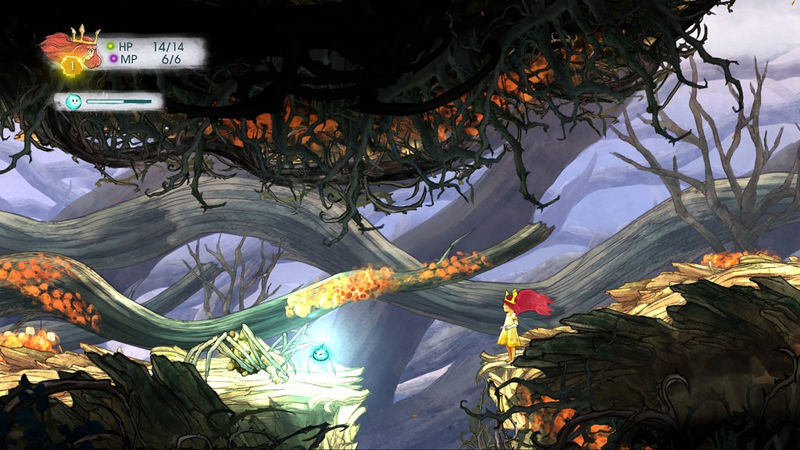 Aurora can float in the air as long as possible, and platforming takes full advantage of her ability by creating environments that often defy physics and test your maneuvering skills. 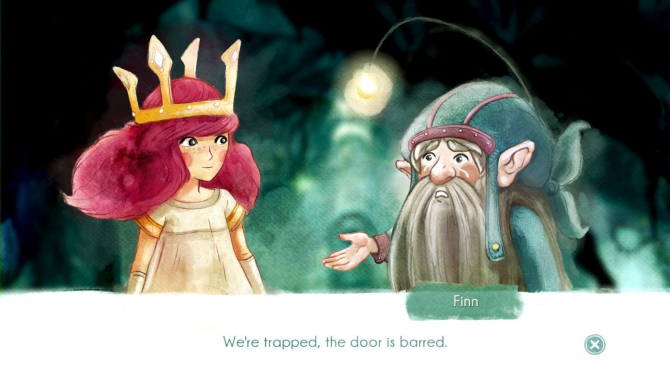 What Child of Light really excels in is the art of no hand-holding. I’m sure old school RPG fans know what I’m talking about; for those who don’t, the RPG genre tends to be a major offender of the “too long and unnecessary” tutorials. This title, however, makes learning about the gameplay mechanics as seamless as possible. Platforming is never explained outright, instead you learn it naturally through trial and error, while the game drops little hint boxes throughout. Combat follows the same rule of thumb, to the point that enemy types themselves become the subtle training for game mechanics and new party members. The plot unfolds completely in poetry, whether in dialogue, messages or narration, and is both simplistic yet highly engaging with some excellent twists thrown in. 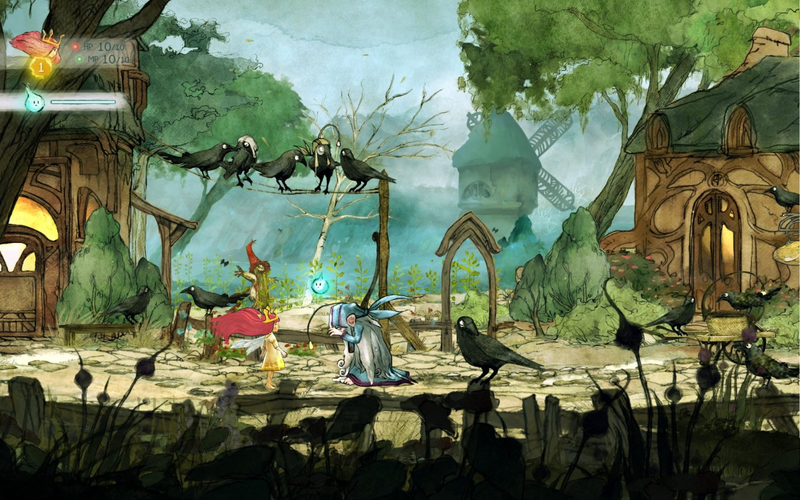 Child of Light‘s stunning art designs shape the storybook world even further. The amazing soundtrack enhances this effect, with a special mention to the varied and lovely battle and boss themes that truly immerses you in a frenzied fight for your life. Playing this title is like diving into a colorful children’s picture book filled with charming characters and poetry, beautiful artwork and music, and a brave little girl that matures gracefully throughout the story. I’m always taken aback by how much detail Ubisoft Montreal injected this game with. When Aurora first enters Lumeria, she’s walking along and suddenly I see and hear this strong shaking. Immediately I began to panic as I assume an enemy is nearby and rushing to attack me, but when I looked over I found it was a enormous giant peacefully meandering in the far background. It’s other things too, like the amount of detail in each character’s animation, such as the way Aurora’s hair flows or how her dress flutters when she flies. These also extend into battle, with every type of attack having a unique animation and each foe type possessing their own movements. Coupled with the excellent designs and it’s a true feast for the eyes. Controls on the Wii U version of this game are quite smooth. Aurora is controlled using the left analog stick on the Gamepad, while Igniculus can be directed by either the right analog stick or with the touch screen. Both methods are completely viable and can actually be used in conjunction (this is my preferred method). A second player can also jump in with a Wii Remote and control Igniculus that way, but it’s rather boring for the second player and not really needed. Lastly, Uplay deserves a special mention. Uplay is a digital service created by Ubisoft and launched back in 2009. 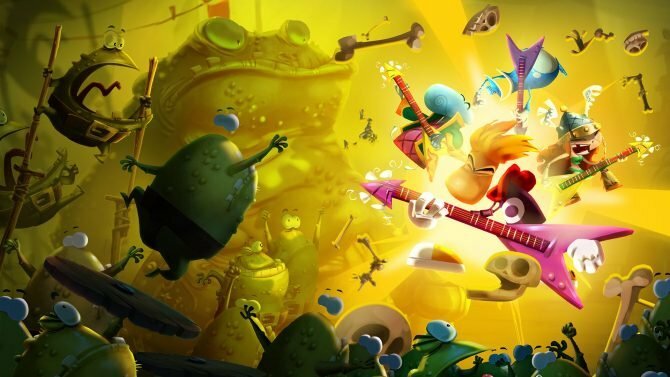 Many gamers are still skeptical of the service due to the disastrous always online element of its early launch, which has been mostly eliminated. 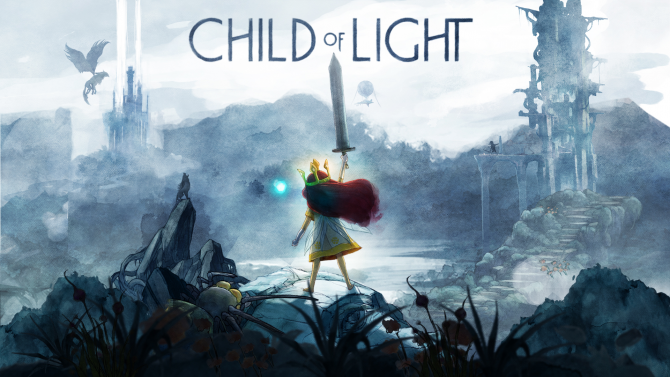 While Uplay is a part of Child of Light, players need not worry, as the service merely serves as a source of Trophies/Achievements. One could literally play the entire game (offline I might add) on a console and not activate Uplay once. What’s magical about Child of Light is that it’s one of those rare games that transcends the boundaries of its genre to create an experience nearly any gamer can enjoy. A spectacular feat and one worthy of the highest praise. Now that the review’s wrapped up, I think in the spirit of things it would make sense to finish the way I began — with poetry.